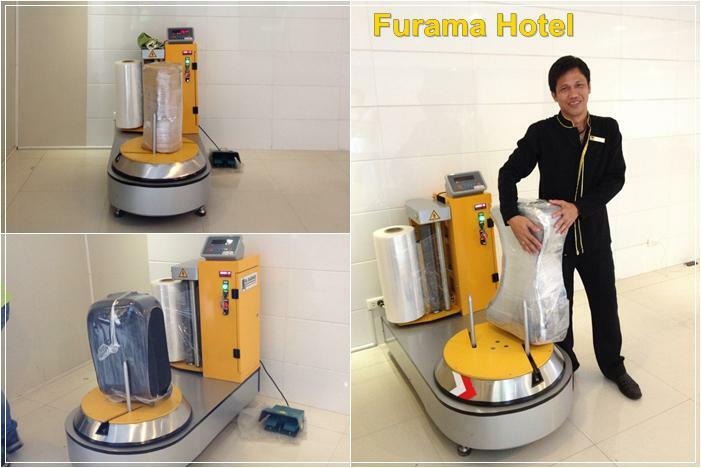 Machine is using a standard type of Stretch Film packaging material for creating a hard to tear,resistance,waterproof cover over the baggage. stretchable,one side sticky,transparent or colored. 2.Usage of standard (normal) size of stretch-film material (500mm. in width, 23 microns in thickness, 1500 meters long. hard paper core inside 76.2 mm). Most of the machines of the competitors are using non-standard 700mm. in wide stretch film, which is not available on the market. 6.Emergency stop can be set on the panel when the baggages wrapped. 7.All set ok,the machine can be auto wrap the baggages. 8.Time delay unit promise the luggages finish wrapped. 11.Machine with the bar behind of the machine. It is easy to pull and push the machine by single person. 12.Wheels of the machine equip with the big type to suitable long-playing move. Looking for ideal Semi Automatic Luggage Packing Machine Manufacturer & supplier ? We have a wide selection at great prices to help you get creative. All the Luggage Packing Machine are quality guaranteed. We are China Origin Factory of Luggage Wrapping Machine. If you have any question, please feel free to contact us.